Napa Group is the world’s leading software house supplying solutions for ship design and operation, its mission being to improve the safety and eco-efficiency of the global maritime industry. 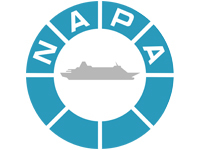 Headquartered in Finland, NAPA employs 170 people in the fields of naval architecture, shipping and information technology. Our offices in Japan, Korea, China, India, Romania, Singapore and the USA, and our extensive network of agents, help us maintain constant and close contact with our customers.